5 Tips for Making Your Engagement Photos Amazing! We’re well into the swing of wedding season now, and connecting with lots of new Brides and Grooms getting married in 2017/2018 and ready to book in their engagement shoots! We are super excited to be capturing such a short, treasured season of your lives together and thought we’d offer a few tips & tricks for making the most of your engagement photo session. Pick a location that means something to you. Whether the place of your first date, or the spot where you got engaged, choosing a location that carries meaning to you is an amazing way to commemorate the other seasons of your life that have brought you to where you are today. For their engagement shoot, Mike & Laura went to the same spot where they got engaged in the first place. These two have had quite the adventure together already and to take a moment of pause to remember the places that make up your relationship is an incredible way to add meaning to your engagement shoot. This is where Mike & Laura got engaged. AWWWH. Choose an outfit that is flattering yet comfortable. 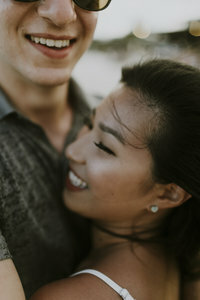 Your engagement photoshoot is a time to have fun and relax! It’s just the two of you and one of us, and our goal is to create a session that is intimate and fun – and sometimes, this means getting a little messy! We might ask you to lay down on the ground, climb along a fallen tree trunk or get your toes in the water at the beach. Pick an outfit that you feel great in, and that is comfortable for movement and having fun. We suggest avoiding super-tight skirts and dresses that might make you feel awkward or uncomfortable when sitting down. We absolutely love the dress Jacquelyn wore to her engagement shoot – it was long, bright, colourful and still flattering to her figure. Jacquelin’s dress is on point. Choose props and ideas that reflect your wedding day. You might be using photos from your engagement shoot to populate your wedding website or create a beautiful image on your Save the Date. Help your guests prepare for the theme and vibe of your wedding day by picking props and accessories that point to your wedding. For their travel-themed wedding at Liuna Station, Izabella and Peter chose to take their engagement photos at the Markham Museum railway and include old suitcases and picture frames in their photos. This helped guests prepare for the highly thematic event that was to come! Iza & Peter’s travel themed engagement shoot flowed perfectly into their Liuna Station wedding day. John and I are both suckers for soft, naturally lit photos. If we had it our way, it’d be golden hour all day long and every photo would be backlit. We can’t make that happen on your wedding day, but your engagement shoot offers a lot of flexibility in terms of timing the photos to fit with your vibe perfectly. We usually suggest photoshoots in the late afternoon and early evening to capture a nice, low sun that offers a glowy look, perfect for photos in the spring, summer or fall. In the winter, we love overcast days and the way the snow acts as a natural reflector – please, someone take us tobogganing for your engagement shoot! Engagement shoots are meant to be fun and relaxed, and help you get to know your photographer better. John and I try not to make a production of your engagement shoot and instead want to capture the two of you just having fun and being yourselves. Make sure you laugh; relax! Don’t feel the need to look perfect or put the pressure on yourself to create an amazing image – that’s our job, and we hope to do it well. For their engagement shoot, Valentina and Trevor took me on a hike to the Grotto at the Bruce Peninsula National Park. They laughed and had fun while climbing around the rocks and enjoying the scenery, and the photos reflect their true love for one another. When I asked Val what colour dress she was wearing for her shoot, she was like, LOL WE ARE HIKING. We hope those tips are helpful and can’t wait to work with you on your engagement photoshoot!